NASA astronaut Scott Kelly, who is wrapping up an unprecedented 340-day mission aboard the International Space Station. A new documentary takes viewers inside the International Space Station to experience a year in space alongside NASA astronaut Scott Kelly, who is just finishing his stay on the orbiting complex. The hourlong PBS-Time Magazine documentary, "A Year in Space," airs on PBS at 8 p.m. EST Wednesday (March 2), the day after Kelly and cosmonaut Mikhail Kornienko returned to Earth to wrap up their landmark 340-day space mission. Check local listings for the exact time in your area. "But this is really in some ways different because it is the completion of a chronicle that we've been telling for a long time," PBS producer Bill Margol told Space.com. The PBS-Time collaboration began when Margol got wind of Time's plan for the one-year mission, which is aimed at collecting data that will help pave the way for crewed missions to Mars. The magazine planned to do a series of digital shorts with several staff members, including Jeffrey Kluger, an editor and writer at Time who is perhaps best known for co-writing the book "Lost Moon: The Perilous Voyage of Apollo 13" (Houghton Mifflin, 1994) with Apollo 13 astronaut Jim Lovell. "When Scott Kelly originally signed up to do this mission, our editors and writers at the time were very interested [in covering it]," Ian Orefice, senior executive producer of Time Inc. Video, told Space.com. Initially, the plan was to do a one-off video story on Kelly, but when the producers visited Kelly and saw the interaction with his own family, "we realized there was a much bigger opportunity," Orefice said. Time committed to do a series of digital shorts, and PBS then signed on to bring a two-part documentary to a television audience. The documentary that premieres Wednesday night is the first installment of this two-part series. Part one features Kelly's time on the space station, showing footage that even obsessive followers of NASA TV haven't seen. For example, there are several moments of video showing Kelly's spacecraft catching up to the International Space Station. Inside the spacecraft, Kelly, Kornienko and cosmonaut Gennady Padalka joke about how long the mission will be. "Don't remind me," one spaceflyer moans in Russian. There also are long camera shots showing astronauts floating through the different modules of the station, which has been continuously occupied by rotating crews since November 2000. Kelly does interviews with the camera, occasionally pausing for a crewmember to go by to do his or her work. Several television interviews with Kelly are shown on camera, and Kelly also provides some exclusive narration for the documentary that he recorded before and after he left the ground. Also participating are his long-time partner, NASA public affairs officer Amiko Kauderer; Kelly's two daughters; his identical twin, Mark, himself a former NASA astronaut (who is participating in the year-in-space mission as a genetic control for Scott); and Mark Kelly's wife, Gabrielle Giffords, (a former Democratic congresswoman from Arizona). "It's the longest long-distance relationship in the history of mankind," Orefice said of Kelly's relationship to his family. Throughout the mission, Scott Kelly has stayed in touch through phone calls. Kauderer records videos of the things Kelly misses on Earth, such as rainstorms. "It's pushing the boundaries of manned exploration," Orefice added, "and whether we could go to Mars. We just thought it was an amazing digital opportunity for a documentary." The second part of the documentary, which is scheduled to air in 2017, will focus on Scott Kelly's recovery, as well as the science gathered during his time in space. "A Year in Space" will air at 8 p.m. ET/7 p.m. CT on PBS on March 2. 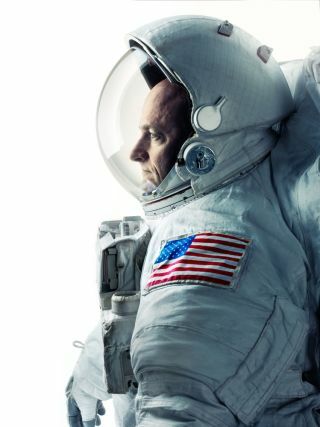 To learn more about the documentary, visit: http://www.pbs.org/a-year-in-space/home/.